WASHINGTON — It's a simple idea: Pair the control of a neglected tropical disease with a more prominent disease that afflict the same populations to reduce morbidity and mortality. The approach could be a win-win, but for public health officials, having evidence to support implementation of an integrated approach is vital. "The information to support this dual effort is available in academic journals, but translating the information into a usable and practical format available to the right people at the right time is key to changing the way co-endemic diseases are controlled," says Claire J. Standley, PhD, MSc, assistant research professor with Georgetown's Center for Global Health Science and Security (CGHSS). To meet that challenge, Standley, along with a group of global health researchers based at Georgetown University Medical Center, have created a web-based tool easily accessible to public health decision-makers on the ground. 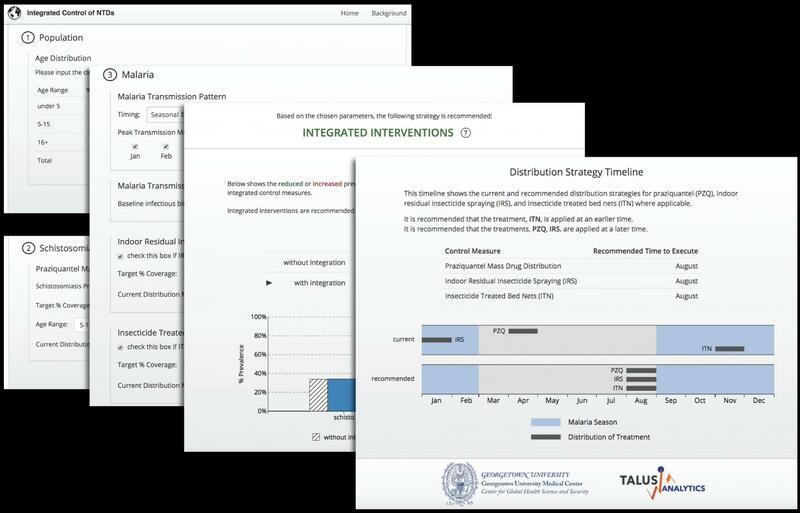 For now, the tool – a website app with a simple interface – pairs schistosomiasis, a neglected tropical disease, with malaria and allows users to enter factors based on local conditions and political constraints to determine the outcome of integrating control measures. The method and app are described in PLOS Neglected Tropical Diseases April 12. Malaria and schistosomiasis are co-endemic throughout much of sub-Saharan African as well as certain regions of South America, the Middle East and Southeast Asia. Both are known to have complex immunological and pathological interactions. In all of these places, children experience the greatest impact of these diseases. "This disease combination is particularly interesting," Standley explains. "We know that having schistosomiasis increases the risk of severe malaria. So if, for example, public health officials are in a community handing out bed nets, it could make sense to also treat for schistosomiasis because of the down-the-road benefit of reducing the risk of malaria." In future iterations of the tool, the team plans to add financial and resource allocation data to the app. "This would allow users to also assess cost-effectiveness and other real-world benefits of integrating disease control," she says. "We want to literally put the information in the hands of those making practical decisions on the ground to significantly increase the efficacy of disease control." Collaborating investigators on the project include Rebecca Katz, PhD, MPH, co-director of the CGHSS and principal investigator on the project; Erin M. Sorrell, PhD, MSc, assistant research professor in the CGHSS; and investigators from Talus Analytics who provided modeling expertise, including Ellie Graeden, PhD (also an affiliate in the CGHSS), and Justin Kerr, PhD. The research was supported by a Grand Challenges Explorations grant from the Bill & Melinda Gates Foundation. The tool is available online here. The Center for Global Health Science and Security (GHSS) is based at Georgetown University Medical Center. GHSS scientists conduct research to help build sustainable capacities to prevent, detect, and respond to public health emergencies worldwide. Connect with GHSS on Twitter (@georgetown_ghss). Georgetown University Medical Center (GUMC) is an internationally recognized academic medical center with a three-part mission of research, teaching and patient care (through MedStar Health). GUMC's mission is carried out with a strong emphasis on public service and a dedication to the Catholic, Jesuit principle of cura personalis — or "care of the whole person." The Medical Center includes the School of Medicine and the School of Nursing & Health Studies, both nationally ranked; Georgetown Lombardi Comprehensive Cancer Center, designated as a comprehensive cancer center by the National Cancer Institute; and the Biomedical Graduate Research Organization, which accounts for the majority of externally funded research at GUMC including a Clinical and Translational Science Award from the National Institutes of Health. Connect with GUMC on Facebook (Facebook.com/GUMCUpdate), Twitter (@gumedcenter) and Instagram (@gumedcenter).